Jodia Peters of Colorado had an abortion when she was sixteen. Seven years later, she testified in favor of Amendment 25, a bill that would require abortion facilities to give information about abortion’s risks, the development of preborn babies, and abortion alternatives to women seeking abortions. Under Amendment 25, which was similar to laws enacted in other states, women would not be forced to view any of this information; it would only be offered. They would have the option to learn about what abortion would do to their babies, and what it might do to themselves. Peters said she had no idea of the possible medical and emotional risks [of abortion]. Many came true for her. She became severely depressed and had uterine scarring which, five years later, caused the premature birth of her son, Jereth. Now 3, he’s had seizures and faces possible eyesight complications. Depression and premature birth are two recognized risks of abortion. Two studies from Finland found that the suicide rate for women who had abortions was 6-7 times greater than for women who gave birth. Another study found that 60% of aborting women experienced suicidal thoughts. A study in the Medical Science Monitor found that aborting women had a 65% higher risk of clinical depression. Other studies found that women who aborted needed mental health treatment more frequently than women who carried to term. This finding applied to both inpatient and outpatient care. A list of these studies can be found here. Many studies have found a link between abortion and subsequent premature births. PreventPreterm, a site set up to educate women about the risk factors for premature birth, has a 46 page report listing the many studies that show the abortion/preterm birth link. I think my life would have been different with more information. If I had numbers for adoption agencies, or had 24 hours’ notice… But I didn’t know I had any other kind of support. She also wishes she knew what her unborn child looked like at 11 weeks, but she says the ultrasound presented to her by the abortion practitioner was done too quickly. When a doctor showed her Jereth’s ultrasound at the same stage of pregnancy, she clearly saw fingers and toes. 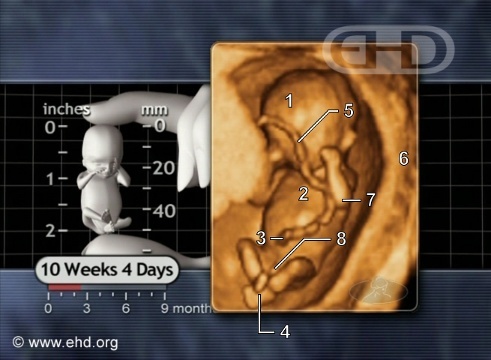 By eleven weeks, a preborn baby is fully formed with arms, legs, fingers, and toes. The child has a beating heart and brainwaves , and every organ he or she will have at birth. The baby even “breathes” amniotic fluid with his developing lungs, preparing them to work after birth. He or she already shows a preference for using her right hand (being right-handed) or left (left-handed). He or she has unique fingerprints that will never exist again on any human being. It showed the instruments they used. I remember the words, ‘gentle suction’ and ‘slight pressure,’ all these rosy words, everything to make me feel good. In reality, this “gentle suction” would rip her fully formed baby apart limb from limb, dismembering her. To see a picture of what such “gentle suction” does to an eleven week preborn baby, go here (warning: very graphic). Any feel-good sense vanished when the abortion practitioner entered the room with a brief hello, and quickly began dilating her cervix without taking any time to visit with her. Not until after the abortion was she given a small booklet called “Facts for Abortion Patients.” She recalls reading for the first time about excessive bleeding, possible infection and other dangers and risks associated with abortion. Only then, after reading the book following the abortion, did she learn the name of the abortion practitioner. Pro-choicers claim they care about women, but they allow situations like Jodia Peters’ to continue to happen when they fight against informed consent laws that would protect women.